The bk file extension is associated with Power Chess computer game for Microsoft Windows developed by Sierra On-line in 1996. The bk file stores opening book data. Sierra On-line was acquired by Activision Blizzard in 2008. Power Chess is a basic chess game. It includes internet play and a large array of boards and options. It also has a lot of history and lets you watch over 150 famous chess matches like Deep Blue vs. Gary Kasparov. The AI is very good and has many opponents, a Power Chess Queen that gives you advice as you play, and a king thats learns your strategy. Use Power Chess to work with bk files. Power Chess may be able to export *.bk files to other formats. and possible program actions that can be done with the file: like open bk file, edit bk file, convert bk file, view bk file, play bk file etc. (if exist software for corresponding action in File-Extensions.org's database). 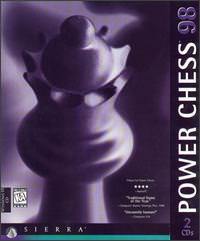 Click on the software link for more information about Power Chess. Power Chess uses bk file type for its internal purposes and/or also by different way than common edit or open file actions (eg. to install/execute/support an application itself, to store application or user data, configure program etc. ).